The Big Game comes with big appetites, even for the little ones in the house. While some of the grown up favorites might be a fit for the smaller ones in the group, others (like spicy buffalo wings and jalapeno-heavy nachos) might leave the kiddos feeling left out. As our crew grew beyond baby snacks, they wanted to be included in the big spread. What could we make that would give them a spot at the buffet, but was also yummy enough for the grown-ups to nosh on, too? Enter the Cracker Stacker Bar! The prep for this Cracker Stacker Bar is insanely simple. And with lots of flavors, it’s sure to quickly become a party favorite. 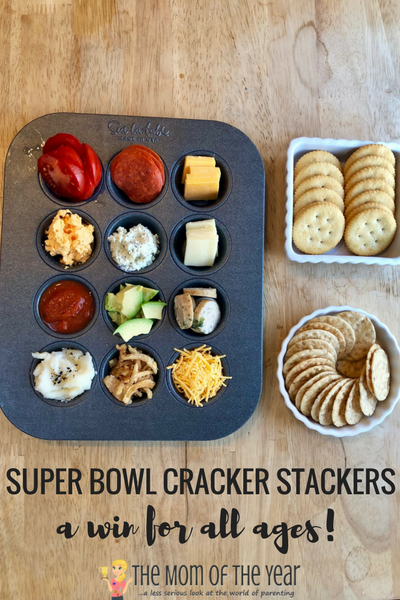 Grab a couple muffin tins stuffed with a lineup of tasty spreads and toppings, pair with a basket or two of your favorite crackers, and let your team get to work! Clean up is a breeze–just toss the muffin tins in the dishwasher! 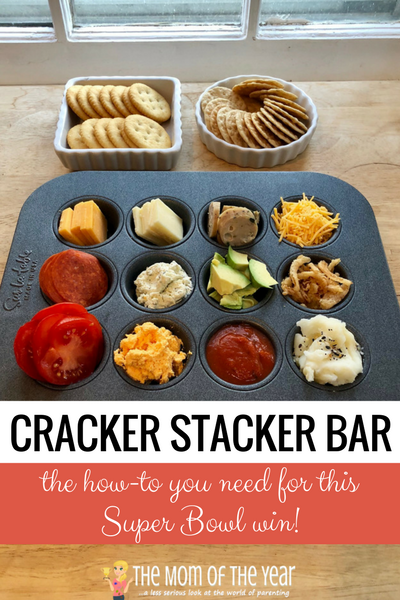 And you can’t beat how fun this Cracker Stacker Bar idea is–let your imagination run wild with the choices you offer. You can go savory, all sweet, or a combo of both. Our kiddos love challenging each other to try new flavors, which is always great experience for little ones. 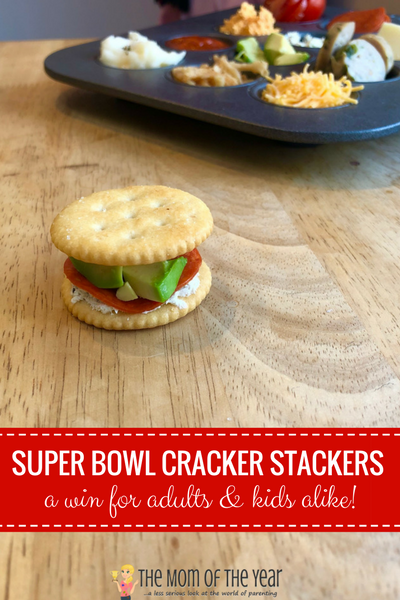 Now that you have the whole scoop on the Cracker Stacker Bar, get out there and win the Big Game with this idea! What a GREAT idea!! I’m totally buying a muffin tim for each child. Individual tins? I think we know who’s REALLY going to win the big game, and it’s you! Such a cool idea – kids will love this!! Kids adore it, and parent’s end up sneaking in on the action most of the time, too! Why for kids? I want to have this yummy tray for myself! 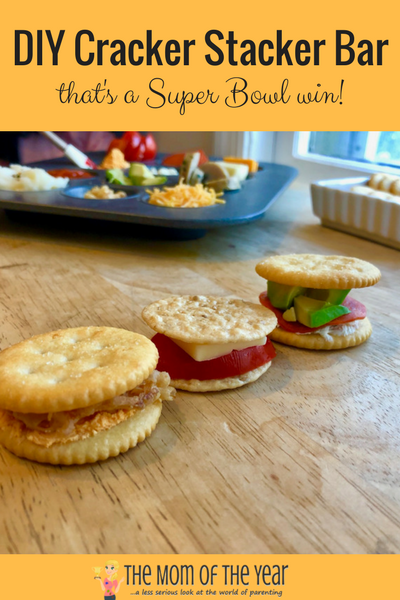 🙂 Joke aside, this is also a great afterschool snack idea. Prep it, cover with saran wrap and have it ready for kids when they come home. 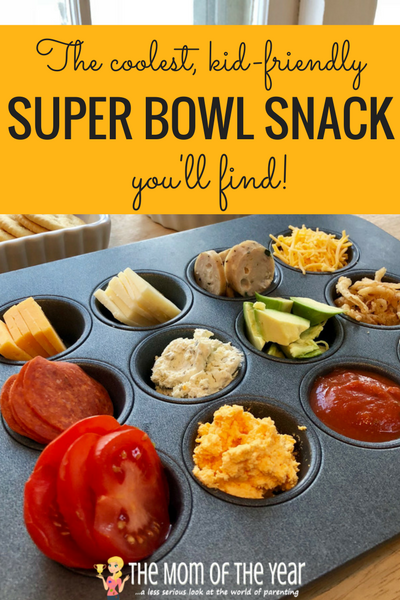 Love it as an after school snack idea, too! We’ve also used the tins on taco night so everyone has just the right fixin’s at their fingertips!